Anyone who has ever seen Back to the Future 2 has probably dreamed of owning a hoverboard. Thankfully, an exciting new device from Onewheel may be one step closer to making that dream a reality. Ok. So it’s technically not a hoverboard. 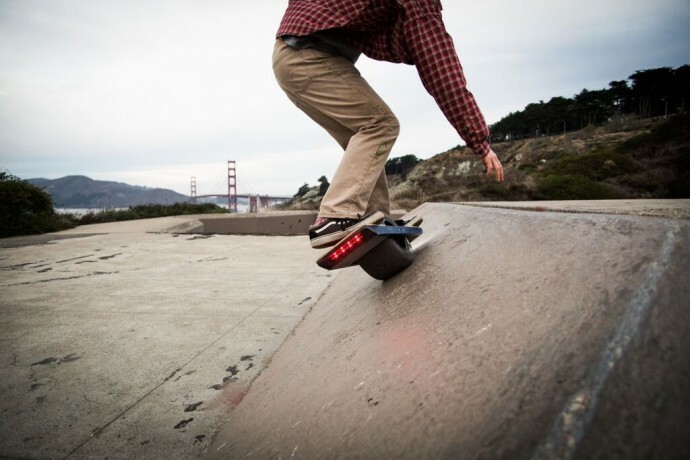 But it is an exciting new improvement over traditional skateboards and similar devices. Onewheel is basically a motor-powered skateboard that has one wheel instead of four. Designed by a San Francisco start up, Onewheel allows riders to feel like they’re riding on air, while removing the need to push or pedal. To use Onewheel, the rider places one foot on the rear of the board, and the other foot on the front. Both sides of the board contain pressure sensing pads, engaging the battery-powered motor inside the wheel. Electronic sensors, meanwhile, help the rider stay balanced. Leaning forward zooms the rider forward, while leaning back slows the rider down, eventually putting the board in reverse. In some ways, the handling is similar to a Segway. Together, the design gives the rider a unique “hoverboard-like” feel. As for speed, the board tops out at a respectable 12-14 mph. It is pretty versatile, too. Unlike most skateboards, the Onehweel handles well over dirt, grass, and puddles. It also turns on a dime. While its battery only lasts 4-6 miles (a little less than an hour for most riders), it’s battery recharges in only 20 minutes. A cable and spare battery help make it easy to recharge on the go. Like many startups, Onewheel started as a project on Kickstarter. The Kickstarter campaign quickly took off, cruising past its $100,000 goal, and eventually raising over $630,000. Today, Onewheel is working on shipping its Kickstarter pre-orders while accepting new order online. Although exciting, the initial price tag of $1,499, is probably too expensive to attract casual consumers just looking for a novel experience. Onewheel will probably have to lower its price point in order to attract more customers. It will also have to find a way to beat out its competitors. Several startups have also been working on similar one wheel “ridables” designed to give riders a fast, fun, motor-powered transportation alternative. Solowheel, for example, bills itself as an “electric stand-up unicycle,” and has riders stand on pedals on either side of a large, electric wheel positioned between the rider’s legs. The Solowheel, made by a Washington startup, also retails for about $1500. Another company, Airwheel, makes an almost identical product. PhunkeeDuck is similarly priced. This two-wheeled “evolution of transportation” looks like a log with footpads. Apparently popular with some celebrities, it too uses an electronic motor and sensors to propel riders and keep them balanced. And then there are still other competitors, like ZBoard. Zboard looks more like a traditional skateboard; its main difference is a motor. Unlike other motorized skateboards, however, ZBoard’s top model is relatively lightweight and boasts an impressive 20 mph top speed and 24 mile range. Zboard comes from a Hermosa, CA based startup that was also launched on Kickstarter. ZBoard’s main competitor Boosted Boards, allows users to reach and control speeds of up to 22 mph through a wireless remote. With models starting at $999, the Boosted Boards’ electric skateboard is the least expensive of the bunch. Together, there’s a burgeoning group of startups working to revolutionize personal transportation. While all of their products are currently very expensive, they are also very exciting. If prices drop in the future, look for one of these startups to blow up as the leader of the “next big thing”—that is, at least until there are actual hoverboards.